The Motorola Moto Z3 for Verizon Wireless is a solid contender in the $500 range. It covers the basics and then some, while offering flexibility thanks to the selection of Moto Mods accessories. The Z3 may be about the same size/shape as last year's Z2, but it has a brand new screen, reduced bezels, and a more modern look. 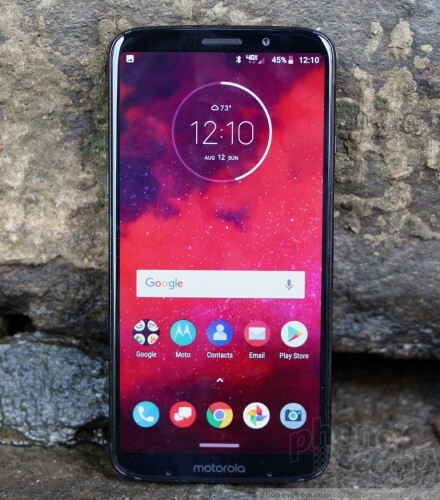 The button placement — including the side-mounted fingerprint reader — works well, and Motorola made the right choice in including support for memory cards and USB-C. The screen looks great; call/data performance is up to snuff; and battery life is good even without a battery Mod attached. Motorola's variation of Android is one of the best, thanks to its light touch and usable enhancements. The camera software is powerful, and the image quality matches the phone's price point well. Further, the Z3 will eventually be able to upgrade to 5G thanks to a forthcoming Moto Mod from Motorola and Verizon. Verizon sells the Moto Z3 for $480. In this segment of the market, few phones offer as much value as the Motorola Z3, particularly if you're looking to future-proof your phone against the pending arrival of 5G.